Having trouble reading this email? Download the PDF. More than 99% of the world's tropical glaciers are located in the Andes Mountains in South America, of which 71% are located in Peru, concentrated on the Cordillera Blanca, and 20% in Bolivia (Kaser, 1999; Rabatel et al., 2013; Bury et al., 2011; IRD et al., 2007). Recent studies have found the glaciers to be melting at an accelerated rate. Though glaciers are melting around the world, in the Tropical Andes the nexus of melting glaciers, dwindling water resources, climate change and a dense population meet (Bradley et al., 2006), creating an urgent need for awareness and management. 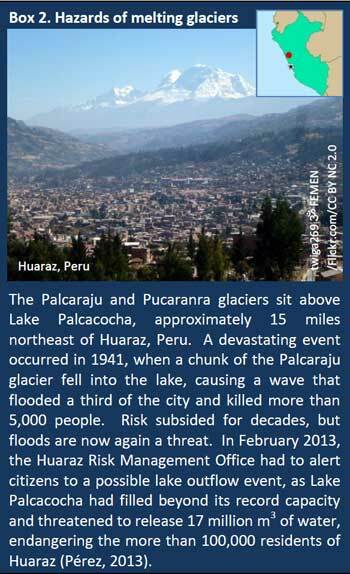 This bulletin will focus on the impacts of this reported accelerated loss of tropical glaciers to water supplies in Peru as well as broader impacts to the hydrologic cycle, future water supplies and ecosystem status. Glaciers dot the western part of South America and can be divided into three general regions: 1) the Tropical Andes, beginning at the start of the Andes mountain range in western Venezuela and stretching south to 23°S latitude (Vuille and Bradley, 2000); 2) the central Andes in eastern Chile and 3) the Patagonia Ice Fields (North and South) in southernmost Chile and Argentina below 46°S (Glasser et al., 2011) (Figure 1). Glaciers in each region have been reported to be retreating at varying rates and threatened by future climate change (Rabatel et al., 2013; Willis et al., 2012; Nicholson et al., 2009). More than 80% of freshwater available for downstream populations and ecosystems in the semi-arid tropics and subtropics originates in mountains (Messerli, 2001). Glaciers partly contribute to the water that travels down the western slope of the Andes, supplying coastal regions with water, mostly during the dry season (Chevallier et al., 2011). Where a distinct rainy season occurs only once a year and lasts only a few months, such as in parts of Peru and Bolivia, melting snow and glaciers are a crucial water supply for the dry season (Peduzzi et al., 2010; Kaser, 2001; Rabatel et al., 2013). The dry season generally lasts from May to September (IRD et al., 2007), but may vary slightly according to region and year. A recent overview of the findings of many studies conducted in recent decades (Rabatel et al., 2013) reports that glacier loss in the Tropical Andes has accelerated over the past three decades and now is occurring at an unprecedented rate. This loss has already had some ecological and social effects and could lead to the disappearance of some glaciers, especially those in lower elevations (Bradley et al., 2006; Urrutia and Vuille, 2009). Figure 1: Glaciers of South America. Source: Glacier location data from WGMS, 2012; Rabatel et al., 2013; Digital Elevation Model (DEM) from: USGS-EROS, 1996; visualisation by UNEP/GRID-Sioux Falls. Each country in the Tropical Andes has experienced significant decreases in glacier area and mass balance (See Box 1). Locations of features mentioned are shown in Figure 2. Venezuela has the smallest area of glacier coverage of any country in the Tropical Andes. In 1952, glaciers covered an area of 3 km2, spanning four peaks, but by 2003 only one peak, Humboldt, had glacier cover remaining (about 1 km2) (Azancot, 2010). Between the 1950s and the mid-2000s, 51% of glacier coverage in Colombia was lost, with the greatest loss occurring between the late 1990s and mid-2000s. In just the five years from 2002 to 2007, the total amount of glacier area shrunk from 60 km2 to less than 45 km2, with some regional differences in pace and magnitude of retreat (Poveda and Pineda, 2009). Approximately 30% of glacier surface area on Nevado del Huila was lost in just two years due to volcanic eruptions in 2007 and 2008 (Rabatel et al., 2013). Four of Colombia's six remaining glaciers are on volcanos, which can increase the pace of glacier loss (Rabatel et al., 2013; Poveda and Pineda, 2009). Poveda and Pineda (2009) project that all Colombian glaciers will disappear within the 2010-2020 decade. Some glaciers in Ecuador are also located on volcanoes. The Antisana glaciers (12 and 15) experienced a period of rapid retreat between 1995 and 1999, followed by a short period of advance from 1999 to 2001 (Vuille et al., 2008) and another year of advance, in which a few metres were gained, in 2008 (Rabatel et al., 2013), but since then, Antisana glaciers have begun to retreat again (Vuille et al., 2008). Most of the world's tropical glaciers are concentrated along the Cordillera Blanca in Peru (Bury et al., 2011). The Cordillera Blanca alone lost about 200 km2 in glacier surface area from 1980 to 2006, going from 742.8 km2 to a little more than 500 km2 (Ordo�ez et al., 2010). 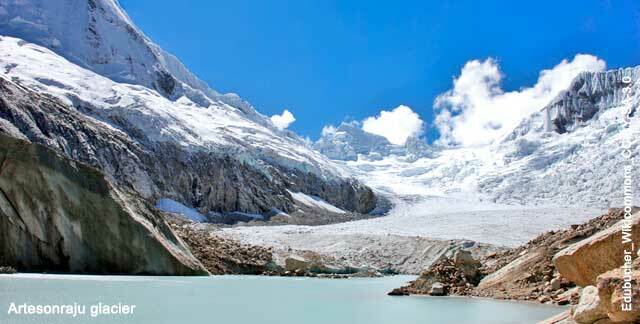 The glacier on Nevado Coropuna, south of the Cordillera Blanca, has decreased at least 60% in surface area since 1955. If it continues to decline at the current rate, it may disappear before 2045, although continued studies on ice thickness and volume are needed (Peduzzi et al., 2010). Across all glaciers on the Andes in Peru, the rate of glacier mass balance loss between 1964 and 1975 was 0.2 m water equivalent per year (w.e./yr) and between 1976 and 2010, the rate accelerated to a loss of 0.76 m w.e./yr (Rabatel et al., 2013). There was a 48% decline in surface area of 376 glaciers investigated in the Cordillera Real in Bolivia from 1975 to 2006 (Soruco et al., 2009); the glacier Chacaltaya completely disappeared in 2009 (WGMS, 2011). Figure 2: Locations of physical features prominent in the discussion of glaciers in the Tropical Andes. Source: Glacier location data from WGMS, 2012; Rabatel et al., 2013; DEM from: USGS-EROS, 1996; visualisation by UNEP/GRID-Sioux Falls. Glaciers located in different regions have varying rates of melt and accumulation due to geographic factors such as latitude and elevation and atmospheric factors such as albedo and climate. Detailed discussion of melting dynamics is outside the scope of this bulletin, but can be found in Mark and Seltzer (2003), Rabatel et al. (2013), and Chevallier et al. (2011) among others. A basic discussion is presented below and definitions of glacier terminology are explained in Box�1. Rabatel et al. (2013) report a trend among glacial melt for selected glaciers between Colombia and Bolivia with extended mass balance time series in the Tropical Andes. They observed that over the past 35 years, glaciers with a maximum elevation of 5,400 m above sea level (a.s.l.) or more have been losing mass balance at a rate of 0.6 m w.e./yr, while those at elevations below 5,400 m have been losing volume at a rate of 1.2 m w.e./yr. This trend may occur because lower elevations are exposed to ablation more than glaciers at higher elevations, which are able to maintain a permanent accumulation zone (Rabatel et al., 2013). Smaller glaciers at low elevations, without a permanent accumulation zone, have also been retreating at a pronounced rate and could soon disappear completely (Rabatel et al., 2013; Vuille et al., 2008). Mountain glaciers serve as a crucial buffer as they help to provide water (as melt water) when rainfall is minimal or nonexistent (Vuille et al., 2008), such as during the dry season or during drought conditions. This implies that some melting is necessary to fuel the existing hydrologic processes and fulfil consumption needs. However, an accelerated rate of melting will bring a short-term surge in supply that could create an unsustainable dependency (Vuille, 2013), degrade seasonal capacity (Bury et al. 2011), increase risk of hazards such as landslides, massive flood events referred to as glacial lake outburst floods (GLOFs) (see Box 2) and avalanches (Chevallier et al., 2011; Chisolm et al., 2012) and alter ecosystems (Rabatel et al., 2013). Reduction in glacier size can and will affect availability of water downstream (Vuille et al., 2008). For example, glacier retreat in the area surrounding the Shallap, Tararhua and Uruashraju glaciers along the Cordillera Blanca could lead to a 30% decrease in average dry season discharge (Baraer et al., 2012). Glaciers supply water to the countries of the Tropical Andes in varying quantities, creating an uneven distribution of potential impact and result in an even larger disparity in the distribution of water resources in the region (Chevallier et al., 2011). Currently, the Antisana glaciers (12 and 15) supply approximately 5% of potable water to the capital city of Quito, Ecuador (Moreno, 2010). About 24% of flow source for the Humboldt and Crespo rivers comes from the Antisana 15 glaciers (UNEP, 2011). In Bolivia, glaciers of the southern Cordillera Real supply approximately 15% of potable water for the urban areas of La Paz and El Alto and can increase to approximately 30% during the dry season from May to August (Soruco, 2012). The World Bank (2008) reports that the volume of glaciers that Peru has already experienced is equivalent to about 10 years of water supply for Lima, Peru's capital of more than 9 million people (UN, 2012), an estimated 7 billion m3 of water. In addition to water supplies for big cities such as Lima and La Paz, glacier melt water also contributes to the water supply for rural settlements (Poveda and Pineda, 2009). For example, melt water from the Coropuna glacier in Peru directly supplies approximately 8,000 people with water and indirectly supports 30,000 people (Peduzzi et al., 2010). Stern (2006) estimates that a 1�C temperature increase could cause smaller glaciers to disappear, affecting the water supply of almost 50 million across the Andes. Loss of glacier cover and eventual reduction in runoff volume has a significant impact on unique ecosystems such as high-altitude paramos, and cloud forests (Bury et al., 2013; Poveda and Pineda, 2009). For many small towns and villages along the Andes, including the Colombian capital of Bogot�, paramos provide a source of potable water (Poveda and Pineda, 2009). Wetlands that cannot continue to be sustained risk increasing fragmentation of biodiversity, already observed in the Quilcayhuanca Valley in Peru (Bury et al., 2013). Additionally, survival of regional and endemic species could be at risk if glacier loss altered the hydrologic system. Based on a study of glacier-fed catchments in the Ecuadorian Andes, Jacobsen et al. (2012) estimate that 11% of regional and endemic species could be lost if glaciers were to disappear and there would also be noticeable loss in species richness downstream. The hydropower industry will also feel the residual effects of melting glaciers such as reduced streamflow, which could result in decreased efficiency and energy output. Since hydropower accounts for approximately 71% of electricity generation in Colombia, 49% in Ecuador, 32% in Bolivia and 56% of energy in Peru (World Bank, 2010), maintaining the integrity of the industry is important for the people of the Tropical Andes. While glacier melt water does not supply all the water needed for hydropower, it does have some impact. Vergara et al. (2007) derived an estimate for the impact of the reduction of glacial melt water on the power generation capacity of the Ca�on del Pato hydropower plant on the Rio Santa in Peru. They conclude that a 50% reduction in glacier runoff would result in a decrease in annual power output of approximately 10% (from 1540 GWh (gigawatt hours) to 1250 GWh). Further, if glacier melt water disappeared completely, annual power output would be reduced to 970 GWh. Additional regional impact studies are needed to determine the localised impact and potential for future impact of reduced flow to rivers that are used for hydropower. Additional research is needed to quantify the impact future glacier loss will have on the environment and human populations more precisely so that appropriate and effective adaptation and water management strategies can be developed. A challenge in the data analysis process is that some glaciers have been closely monitored for only a few decades, using data with varying degrees of resolution and accuracy, and many missing years of data in between. A Pacific climate shift from 1976 most likely contributed to the accelerated retreat of Chacaltaya (Francou et al., 2003). 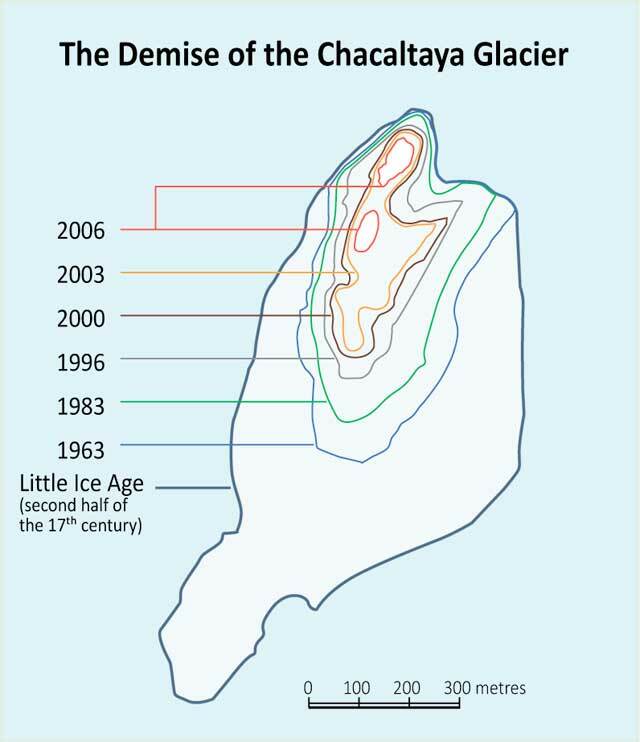 Figure 3 shows the decline of Chacaltaya from the Little Ice Age to 2006. In 2005, it was estimated that only 5% of its surface area and 0.6% of its volume remained, as compared with records from 1740 (IRD et al., 2007). Chacaltaya completely disappeared in 2009 (WGMS, 2011), a few years before scientists predicted that it would (Francou et al., 2003; Mark and Seltzer, 2003). Figure 3: Changes in size of the Chacaltaya Glacier. Source: adapted from UNEP/GRID-Arendal, 2010; IRD, et al., 2007). The Paron watershed, which contains the Artesonraju glacier, has experienced a loss of more than 30% of its glacier surface area since 1930. Glacier coverage in the watershed increased slightly between 1990 and 1997. However, coverage has decreased ever since (Baraer et al., 2012). Figure 4:Artesonraju glacier; Source: Landsat, visualisation by UNEP/GRID-Sioux Falls. The Artesonraju glacier has been losing mass balance at an average of 0.6 m w.e./yr over the past 40 years (Rabatel et al., 2013). 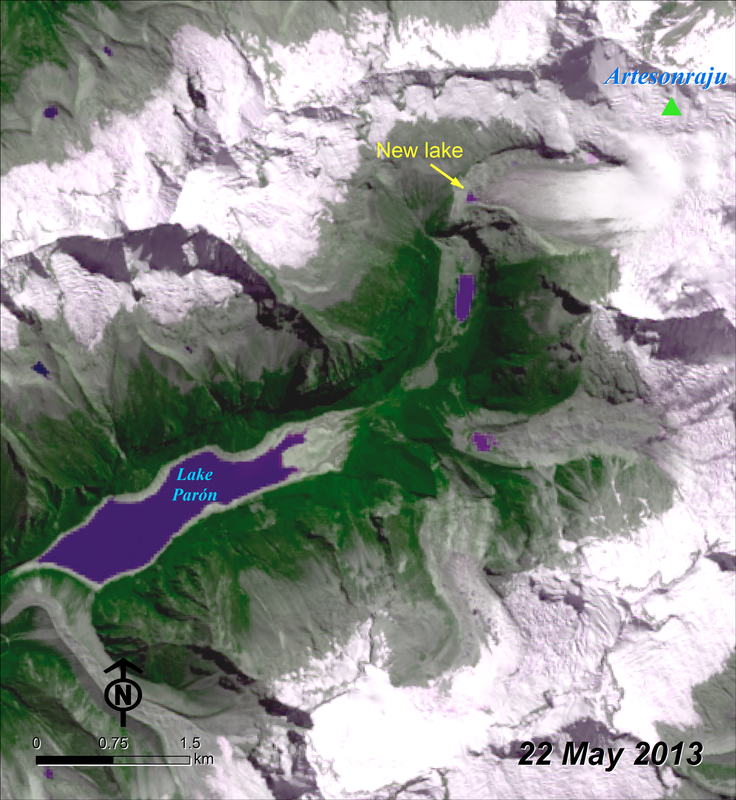 Retreat of Artesonraju and the neighboring Artesoncocha glaciers has resulted in the formation of a new highland lake (denoted with a yellow arrow in Figure 4) that is characterised by overhanging ice and loose rocks, making the area vulnerable to landslides. In addition, the new lake sits above two previously formed lakes, including Lake Par�n, the largest lake in the Cordillera Blanca. This positioning poses a threat for a catastrophic GLOF event should an avalanche or landside, triggered by additional melting into the new lake, occur (Chisolm et al., 2012). Using satellite image analysis, Huh et al. (2012) found that the surface area of Yanamarey decreased 85% between 1962 and 2008. Mark et al. (2010) predict that it will completely disappear by 2020. In addition to retreating, it has also thinned, causing it to lose more than 88% of its volume (Huh et al., 2012) and decreasing its seasonal storage capacity (Bury et al., 2011). Yanamarey lies within the Querococha sub-watershed of the Rio Santa watershed, which has lost more than half of its glacier-covered area since 1948 (Baraer et al., 2012). 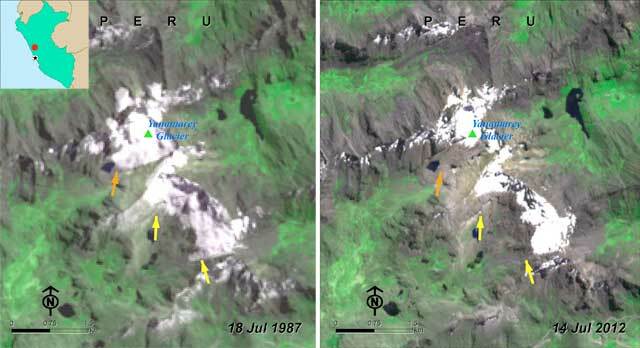 The orange arrow in Figure 5 indicates where Yanamarey has retreated and yellow arrows point to noticeable changes in snow and ice cover from 1987 to 2012 in smaller surrounding glaciers. Melt water from Yanamarey contributes 100% of the streamflow to its watershed during the dry season (June to September) in its immediate watershed and proportionately less downstream – ~24% to more than 50% depending on year and season (Bury et al., 2011) – so continued loss and eventual disappearance will have a significant impact on the hydrologic scheme of the area as well as the associated ecosystems and human populations. Figure 5: Satellite images showing changes in the Yanamarey glacier. Source: 1987 image: Landsat, 2012 image: ASTER, visualisation by UNEP/GRID-Sioux Falls. The disappearance of small glaciers is pronounced and happening on a shorter time scale (Rabatel et al., 2013), making it an important issue for water managers, decision- and policy-makers now. It also presents a pressing supply issue. Decreased water supplies caused by the disappearance of smaller glaciers that contribute melt water will also likely result in increased competition for use and governance among hydropower companies, municipalities and agricultural stakeholders, as well as competition for governance and water rights (Vuille et al., 2013; Bury et al., 2013). The Andean region has already experienced numerous climate changes in the past few decades (Vuille et al., 2008). Over the past decade temperatures have increased ~0.1�C and precipitation has increased slightly in the inner tropics while decreasing in the outer tropics. However, the trend in precipitation is not significant on most regional and national levels, so it cannot explain the retreat in glacial cover (Rabatel et al., 2013; Poveda and Pineda, 2009). Increased temperatures will alter the rain/snow dynamic, causing the rain/snow line to increase in elevation and result in increased rain and decreased snowfall in higher elevations, inhibiting snow accumulation and contributing to rain-induced melting (Poveda and Pineda, 2009). Modeling studies (Bradley et al., 2006; Urrutia and Vuille, 2009) have found that future climate change could bring increased temperatures at higher elevations, primarily affecting the high mountains of Ecuador, Peru, Bolivia and northern Chile (i.e. those with elevations higher than 4,000 m a.s.l.). Additionally, higher temperatures would affect evaporation rates of existing water stores, further putting pressure on water resources (UNEP, 2011) and calling for policy and management measures. Climate change modeling could help project future retreat of glaciers which could influence policy-making for water management and creation of adaptation strategies. However, much still needs to be studied and understood regarding climate interactions and lower latitude glaciers, since research processes still need to be refined and glacier records are not extensive (Sicart et al., 2011). Since melting is predominantly a result of climatic shifts outside the direct control of Andean countries, adaptation is necessary for a sustainable water supply and healthy environment. Policies specific to adaptation to environmental changes can encompass technical, behavioural, managerial and political components (UNEP, 2011). Technical adaptation pertains to physical actions that address the change. In the case of accelerated glacier melt, creation of highland reservoirs to stabilise the cycle of seasonal runoff to increase the efficiency of capturing and storing water (Bradley et al., 2006) would be a technical adaptation. Engaging the community to change its current use of resources and promote ecosystem resilience is one way to address behavioural adaptation. Managerial adaptation can stem from behavioural adaption through the implementation and regulation of land-use practices, encouraged by behavioural changes. An example of using both types of these strategies is the Proyecto Regional Andino de Adaptaci�n, based in Peru. The project is working toward increasing the resilience of the ecosystems and the local economy in an effort to protect itself from impacts of melting glaciers. It also has a cost-benefit component for developing adaptation strategies (Ordo�ez et al., 2010). Further, the Proyecto Glaciares project, a joint venture between Peru and Switzerland that focuses on the regions of Ancash and Cusco, has already begun to take action to mitigate the effects of glacier decline by increasing adaption capacity and establishing disaster risk-management protocols (CARE Peru, 2012). The project aims to generate specific products including early warning systems to address glacial hazards, increasing capacity building through strengthening human resources in the fields of glaciology, climate change and risk management and increasing public investment in monitoring glaciers. Some projects utilise several aspects of adaptation. To help increase ecosystem and economy resilience across several countries of the Tropical Andes, the governments of Bolivia, Ecuador and Peru, in collaboration with the World Bank, are participating in the Adaptation to the Impact of Rapid Glacier Retreat in the Tropical Andes Project (World Bank, 2013). One objective of the project is to create a methodological guide for high-mountain ecosystems adaptation; none had previously existed. This objective was achieved through the AndesPlus sub-project and all four stakeholder countries have agreed. 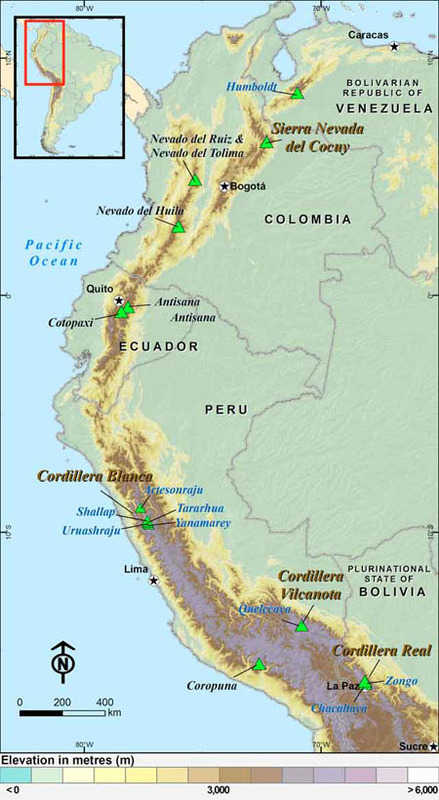 Other results of the overarching project include using ensembles of high resolution data for climate change monitoring and development of corresponding short-term predictions for Ecuador and Bolivia, creation of impact maps on key crops in Peru, completion of studies pertaining to economic impacts and installation and operation of eight new meteorological stations that disseminate information to Bolivia, Colombia, Ecuador and Peru. Through the initiate plans and materials developed, the project hopes to use the successful outcomes as a basis for other projects in the future. Political adaptation strategies concern elements such as zoning regulations and could be applied to water rights. Adequate policies need to be put into place to protect water rights, as there is likely to be an increasing reliance on mechanisms to capture and save water during the wet season to be used during the dry season. Research can model and estimate the impact that decreased runoff will have on coastal and glacier populations alike, but further studies are needed to examine how much water is being used by these communities so that future management activities can be appropriately designed. For cities in which hydropower efficiency or output may be reduced by reduced streamflow, policy- and decision-makers could use the situation as an opportunity to encourage other kinds of renewable energy, aside from hydropower (Bradley et al., 2006), that could lessen the stress on water as an energy source. Water management initiatives taken in Peru are a good example of how regional needs can be addressed. In 2008, a water management framework was created and in the following year, a new water resources law was put into effect: the National System for Water Resources Management (Condom et al., 2012) aiming to develop water management strategies at a watershed level. Since not all watersheds will be affected equally regarding water issues, a local-level approach, such as this one, is needed to accommodate all vulnerable areas and resources. Many data gaps regarding precipitation records and hydrologic models remain, as well as the means to communicate the findings to a general audience, so continued research is needed (Vuille, 2013) to develop the best adaptation strategies and policies possible. Mandates for monitoring and research could be included in legislation, such as in Peru (Ordo�ez et al, 2010), to encourage the continuation of such studies. Specific research areas could address comprehensive mass and energy balance studies (Poveda and Pineda, 2009), distinct properties of clouds and precipitation in the wet and dry seasons and their relationship to mass balance (Sicart et al., 2011), as well as the human-environment interaction and vulnerability (Bury et al., 2011) and quantification of glacier melt water contributions to firmly determine the magnitude of impact of decreased melt water at regional, national and ecosystem levels. Continued climate change research and monitoring is also needed, especially using higher resolution data at a regional level. If the opportunity for long-term adaptation planning is seized now, a more sustainable future can be created. Production and Outreach Team: Arshia Chandera, Ashbindu Singha,b, Erick Litswab, Kim Giesea, Lindsey Harrimana, Michelle Anthonya, Reza Hussaina, Tejaswi Giria, Theuri Mwangib and Zinta Zommersb. Special thanks to Ashbindu Singha,b, Tejaswi Giria, Andreas Salinasc, Charles Daviesc, Isabel Martinezd, Bernard Francoue, Cedomir Marangunicf, Ron Wittg, Andrea Sabellid, Pascal Peduzzig, Silva Giadad, Alvaro Sorucoh, Arshia Chandera and Shelley Robertsoni for their valuable comments, input and review. Baraer, M., Mark, B., McKenzie, J., Condom, T., Bury, J., Huh, K., Portocarrero, C., Gomez, J., Rathay, S., 2012. Glacier recession and water resources in Peru's Cordillera Blanca. Journal of Glaciology 58(207), 134-150. Bradley, R., Vuille, M., Diaz, H., Vergara, W., 2006. Threats to Water Supplies in the Tropical Andes. Science. 312, 1755 – 1756. Bury, J., Mark, B., McKenzie, J., French, A., Baraer, M., Huh, K., Luyo, M., Lopez, R., 2011. Glacier recession and human vulnerability in the Yanamarey watershed of the Cordillera Blanca, Peru. Climatic Change. 105, 179-206. Bury, J., Mark, B., Carey, M., Young, K., McKenzie, J., Baraer, M., French, A., Polk, M., 2013. New Geographies of Water and Climate Change in Peru: Coupled Natural and Social Transformations in the Santa River Watershed. Annals of the Association of American Geographers 103(2), 363 – 374. CARE Peru, 2012. Bulletin October – November 2012 No. 2. CARE Peru. http://proyectoglaciares.wix.com/boletinproyectoglaciares02#!__page-0-copy1/proyecto/vstc5=objetivos (accessed 24.06.13). Chevallier, P., Pouyaud, B., Suarez, W., Condom, T., 2011. Climate change threats to environment in the tropical Andes: glaciers and water resources. Supplement to Regional Environmental Change 11(1), 179 – 187. Condom, T., Escobar, M., Purkey, D., Pouget, J., Suarez, W., Roamos, C., Apaestegui, J., Tacsi, A., Gomez, J., 2012. Simulating the implications of glaciers' retreat for water management: a case study in the Rio Santa basin, Peru. Water International 37(4), 442 – 459. Francou, B., Vuille, M., Wagnon, P., Mendoza, J., Sicart, J., 2003. Tropical climate change recorded by a glacier in the central Andes during the last decades of the twentieth century: Chacaltaya, Bolivia, 16oS. Journal of Geophysical Research: Atmospheres 108(D5, 16), doi: 10.1029/2002JD002959. Glasser, N., Harrison, S., Jansson, K., Anderson, K., Cowley, A., 2011. Global sea-level contribution from the Patagonian Icefields since the Little Ice Age maximum. Nature Geoscience Letters. DOI: 10.1038/NGEO1122. Huh, K., Mark, B., Hopkinson, C., 2012. Changes of topographic context of the Yanamarey glaciers in the Tropical Peruvian Andes. Remote Sensing and Hydrology 2010 Symposium, September 2010, Jackson Hole, Wyoming, IAHS Publ. 352, 2012. IRD, GSAC, UNEP/ROLAC, 2007. The End of Snowy Heights? Glaciers and Climate Change in the Andean Community. Great Secretariat of the Andean Community (GSAC), the French Institute of Research for Development (IRD), United Nations Environment Programme Regional Office for Latin America and the Caribbean (UNEP/ROLAC), and the Spanish International Cooperation Agency. Lima, Peru. Jacobsen, D., Milner, A., Brown, L., Dangles, O., 2012. Biodiversity under threat in glacier-fed river systems. Nature Climate Change Letters 2, doi: 10.1038/NCLIMATE1435. Kaser, G., 1999. A review of the modern fluctuations of tropical glaciers. Global and Planetary Change 22(1-4), 93 – 103. Kaser, G., 2001. Glacier-climate interaction at low latitudes. Journal of Glaciology 47(157), 195 – 204. Kaser, G., Brobhauser, M., Marzeion, B., 2010. Contribution potential of glaciers to water availability in different climate regimes. PNAS Open Access Online, doi: 10.1073/pnas.1008162107. Mark, B., Seltzer, G., 2003. Tropical glacier meltwater contribution to stream discharge: a case study in the Cordillera Blanca, Peru. Journal of Glaciology 49(165), 271-281. Mark, B., McKenzie, J., 2007. Tracing Increasing Tropical Andean Glacier Melt with Stable Isotopes in Water. Environmental Science and Technology 41(20), 6955 – 6960. Messerli, B., 2001. The International Year of the Mountains, the Mountain Research Initiative and PAGES, editorial. PAGES News 9(2). Nicholson, L., Marin, J., Lopez, D., Rabatel, A., Bown, F., Rivera, A., 2009. Glacier inventory of the upper Huasco valley, Norte Chico, Chile: glacier characteristics, glacier change and comparison with central Chile. Annals of Glaciology 50(53), 111 – 118. Ordo�ez, J., Sandro, A., Zubieta, R., et al., 2010. Los Recursos Hidricos y los Glaciares en el Peru. Presentation for Glaciology Course, Oct 25 – 29 2010, Santiago, Chile. http://www.pnuma.org/agua-miaac/CursoGlaciologiaPresent.php. Peduzzi, P., Herold, C., Silverio, W., 2010. Assessing high altitude glacier thickness, volume and area changes using field, GIS and remote sensing techniques: the case of Nevado Coropuna (Peru). The Cryosphere 4, 313 – 323. P�rez, I., 2013. Glaciers: Meltwater catastrophes are forming high in the Andes. E&E Publishing, LLC: Climate Wire. http://www.eenews.net/stories/1059977803 (accessed 16.03.13). Poveda, G., Pineda, K., 2009. Reassessment of Colombia's tropical glaciers retreat rates: are they bound to disappear during the 2010-2020 decade? Advances in Geosciences 22, 107 – 116. Rabatel, A., Francou, B., Soruco, A., Gomez, J., Cáceres, B., et al., 2013. Current state of glaciers in the tropical Andes: a multi-century perspective on glacier evolution and climate change. The Cryosphere 7, 81-102. Sicart, J., Hock, R., Ribstein, P., Litt, M., Ramierz, 2011. Analysis of seasonal variations in mass balance and meltwater discharge of the tropical Zongo Glacier by application of a distributed energy balance model. Journal of Geophysical Research 116(D13105). Soruco, A., Vincent, C., Francou, B., Gonzalez, J., 2009. Glacier decline between 1963 and 2006 in the Cordillera Real, Bolivia. Geophysical Research Letters 36(L03502), doi: 10.1029/2008GL036238. Soruco, A., 2012. Medio siglo de fluctuaciones glaciares en la Cordillera Real, y su efectos hidrol�gicos en la ciudad de La Paz. IRD, La Paz, pp. 227. Stern, N., 2006. The Economic of Climate Change: The Stern Review. London, Cambridge, University Press. UN, 2012. World Urbanization Prospects: The 2011 Revision. United Nations Department of Economic and Social Affairs/Population Division, New York. UNEP/GRID-Arendal, 2010. Chacaltaya glacier. Vital Climate Change Graphics for Latin America and the Caribbean. UNEP/GRID-Arendal. http://www.grida.no/graphicslib/detail/chacaltaya-glacier_128f (accessed 25.06.13). UNEP, 2011. Environment Climate Change Outlook (ECCO) Metropolitan District of Quito Summary. United Nations Environment Programme, Panama. Urrutia, R. and Vuille, M., 2009. Climate change projections for the tropical Andes using a regional climate model: Temperature and precipitation simulations for the end of the 21st century. Journal of Geophysical Research 114(D02108), doi: 10.1029/2008JD011021. USGS-EROS, 1996. 30 arc-second DEM of South America. United States Geological Survey Earth Resources Observation and Science Center. http://databasin.org/datasets/d8b7e23f724d46c99db1421623fd1b4f (accessed 06.25.13). USGS, 2007. Glossary of Selected Glacier and Related Terminology. United States Geological Survey. 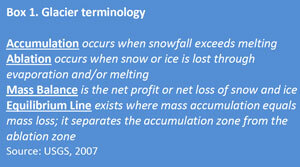 http://vulcan.wr.usgs.gov/Glossary/Glaciers/glacier_terminology.html (accessed 25.06.13). Vergara, W., Deeb, A., Valencia, A., Bradley, R., Francou, B., Zarzar, A., Gr�nwaldt, A., Haeussling, 2007. Economic Impacts of Rapid Glacier Retreat in the Andes. EOS, Transactions American Geophysical Union 88(25), 261 – 264. Vuille, M., 2013. Climate Change and Water Resources in the Tropical Andes. Inter-American Development Bank Environmental Safeguards Unit Technical Note, No. IDB-TN-515. Vuille, M. and Bradley, R.S., 2000. Mean annual temperature trends and their vertical structure in the tropical Andes. Geophysical Research Letters 27(23), 3885 - 3888. Vuille, M., Francou, B., Wagnon, P., Irmgard, J., Kaser, G., Mark, B., Bradley, R., 2008. Climate change and tropical Andean glaciers: Past, present and future. Earth Science Reviews. 89, 79-96. WGMS, 2012 (original, 1999). World Glacier Monitoring Service. World Glacier Inventory. Boulder, Colorado USA: National Snow and Ice Data Center. http://dx.doi.org/10.7265/N5/NSIDC-WGI-2012-02 (accessed 01.06.13). WGMS, 2012 (original, 1999). World Glacier Monitoring Service. World Glacier Inventory. Boulder, Colorado USA: National Snow and Ice Data Center. http://dx.doi.org/10.7265/N5/NSIDC-WGI-2012-02. Willis, M., Melkonian, A., Pritchard, M., Rivera, A., 2012. 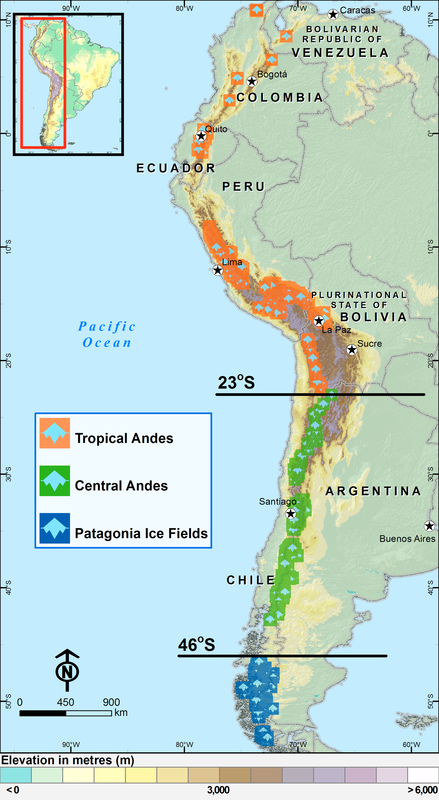 Ice loss from the Southern Patagonian Ice Field, South America, between 2000 and 2012. Geophysical Research Letters 29(L17501), doi:10.1029/2012GL053136. World Bank, 2008. Retracting glaciers impacts economic outlook in the tropical Andes. The World Bank. http://web.worldbank.org/WBSITE/EXTERNAL/COUNTRIES/LACEXT/0,,print:Y~isCURL:Y~contentMDK:21739254~pagePK:146736~piPK:146830~theSitePK:258554,00.html (accessed 26.06.13). World Bank, 2010. World DataBank. http://databank.worldbank.org (accessed 13.09.13). World Bank, 2013. Adaptation to the Impact of Rapid Glacier Retreat in the Tropical Andes. The World Bank. http://www.worldbank.org/projects/P098248/adaptation-impact-rapid-glacier-retreat-tropical-andes?lang=en&tab=overview(accessed 16.09.13).